Start your day in the best way with a bowl of crunchy, homemade granola. Four ingredient peanut butter granola. Packed with crunchy clusters and the perfect mix of sweet ‘n’ salty flavour! If you’re anything like me and completely obsessed with all things peanut butter then you’re in for a treat with this granola. This recipe came about when I was bored one evening, it was one of those rare nights when there was nothing on TV that I was interested in watching and like most food bloggers all I could think of was what crazy new recipe I needed to make ASAP. I’m sure other food bloggers know what I’m talking about? I’m the sort of person as soon as they think of a new recipe idea they HAVE to try it out and see what the result is. In this case, I headed straight for the kitchen that same evening and starting to whip up a batch of the most incredible peanut butter granola. Next came the hardest part, waiting for the granola to bake and then enduring the difficult task of resisting eating the entire tray before breakfast. This granola couldn’t be any easier to prepare. Grab a mixing bowl and add the oats. In a small saucepan gently melt together the peanut butter (crunchy or smooth), honey and a teaspoon of vanilla. That’s all it requires, four simple ingredients and just a couple of minutes of prep time and your oven will do the rest of the work! I like that this recipe only makes a smaller portion of granola. A batch of homemade granola is never safe in my house as I can very easily munch on it all day long and before I know it’s all been eaten! This granola makes a brilliant brekkie sprinkled over a bit of Greek yoghurt or served with milk. The list of topping choices is endless, you could go for some banana slices, fresh berries or even roasted peanuts. The best part is if you’re planning to serve it with milk is the granola will still remain really crunchy and won’t go all mushy and soft. 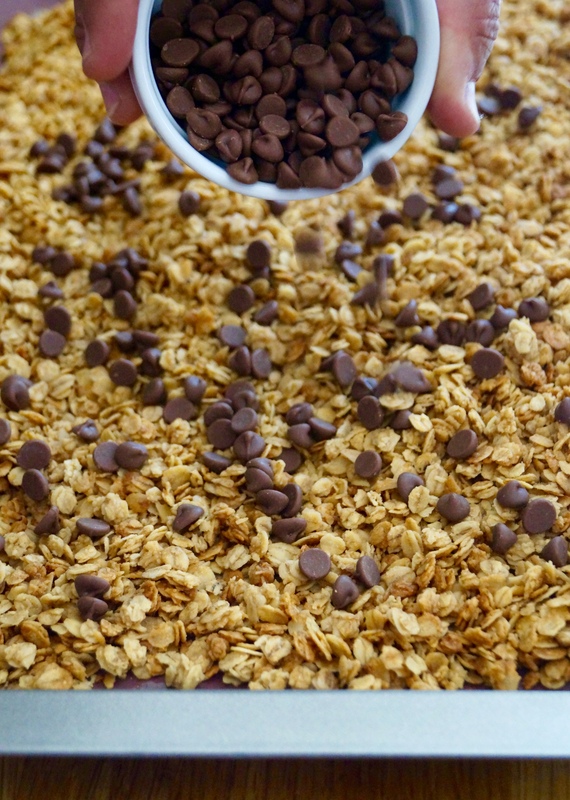 Before I forget, I like to sprinkle some dark chocolate chips into my serving of granola. Also, if you’re lucky enough to get peanut butter chips where you live why not add a few of those to the mix? If you love peanut butter, try this granola. It’s the absolute best and madly addicting. Preheat oven to 170°C / 150 Fan / 325°F / Gas Mark 3. Line a large baking tray/sheet with parchment paper or a silicone baking mat. Add the oats to a large mixing bowl. In a small saucepan add the honey, peanut butter and vanilla. Heat gently and stir until completely melted – don’t let it boil. Add the melted peanut butter mixture to the oats and stir until all of the oats are well coated. Once the granola is baked allow it to cool, as it cools it will harden and get crisp. Store granola in an airtight container. Sweet and crunchy maple pecan granola. 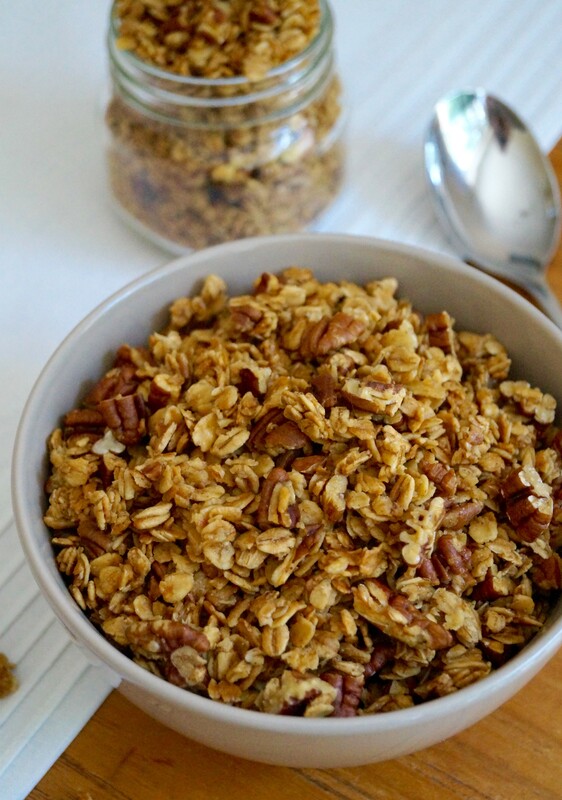 Better than store bought, this granola makes a great breakfast or healthy snack. If you’ve never made your own granola, then this is a brilliant recipe to try. Making homemade granola couldn’t be more easy! I really enjoy baking my own completely from scratch, it makes a great affordable and healthy breakfast and when you make it yourself, the real bonus is you know exactly what ingredients have gone into it. As summer nears to a close, autumn is just around the corner, and I am super excited to start new seasonal baking. So I’m kicking off the new season with this crunchy, golden and delicious maple pecan granola. I’ve shared a few granola recipes on the blog so far, including this vanilla almond granola which is a favourite of ours. I’ve used that granola as a base recipe for this maple and pecan version, the only change I made was cooking the granola at a slightly lower temperature for longer. You can never have enough granola recipes on hand! I’ve added light brown sugar to my granola, this adds a very light molasses flavour and also gives it that perfect crunch. I love the rich maple flavour with the crunchy toasted pecans. When the pecans toast and caramelise in the oven they remind me of pecan pie. My favourite way to serve this granola has to be with milk or Greek yoghurt, topped with mixed berries. But it certainly tastes great on its own – I often munch on a few handfuls for an afternoon pick-me-up. It makes quite an addictive treat to snack on! Preheat oven to 300°F / 150°C / 130 Fan / Gas Mark 2 . Line 1-2 large baking sheets with non-stick parchment paper or silicone baking mats. In a small saucepan melt together the maple syrup, oil and vanilla extract on a medium heat. When the mixture is runny, take off the heat. In a mixing bowl mix together the oats, brown sugar, chopped pecans and cinnamon. Pour the wet mixture over the oats and mix to coat fully. Make sure you cover all the oats. Spread out evenly on 1-2 large baking trays. Bake for 45-60 minutes, stirring every 15 minutes. Cook until light golden and toasted. Granola will feel soft at this point, but as it cools the air will make it crunchy. Remove tray from oven once cooked and allow to cool. Once cooled store in an airtight container or jar for up to 1 month. You can use any oil you like – coconut oil, regular vegetable or canola oil would work well. Adjust spices to your taste, add ins include a 1/4 tsp ground nutmeg or cloves. You can also add an extra 1/2 tsp cinnamon for more spiced flavour. Top with anything you like. Dates would really well with this granola, but you could also top with sliced strawberries, banana or blueberries. 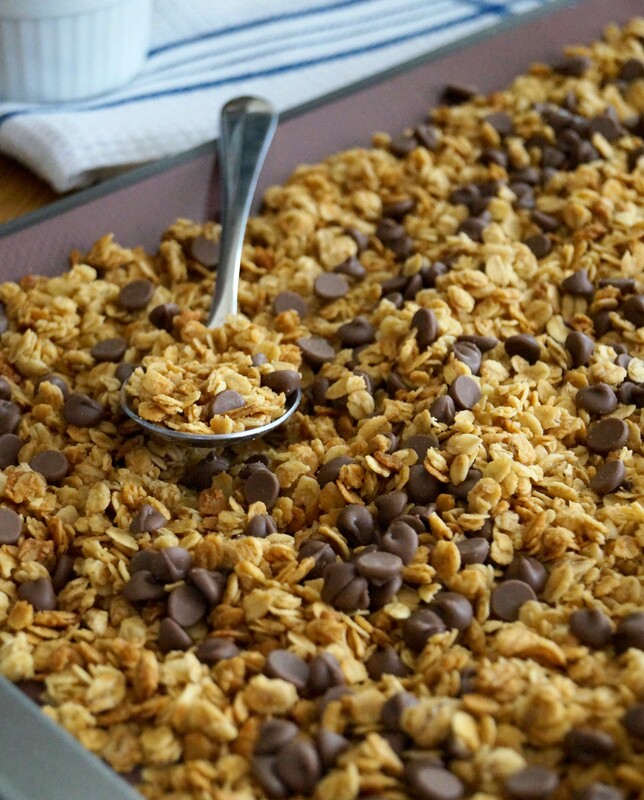 Peanut butter and chocolate chip granola. The perfect mix of sweet ‘n’ salty flavour. If you love peanut butter, then this granola recipe is for you! Peanut butter granola has to be one of my favourite breakfast recipes. PB + chocolate = amazing flavour combo! I have always loved making my own granola – when it’s homemade you know exactly what’s gone into it and you can easily control the sugar levels. It’s also a super fun activity baking your own. Plus, because of the chocolate chips, this granola definitely feels like you’re eating dessert for breakfast! Ever since I shared this delicious vanilla almond granola, I’ve been hooked on creating and testing out new granola recipes. So many granola recipes, so little time! The granola requires just a handful of ingredients, it’ll take you 30 minutes at tops to bake and makes a great breakfast treat any day of the week! You know it’s SO good because it even coerces me to get out of bed in the morning, which is usually a very hard thing to do! The granola makes a great snack too, you could easily add a handful of M&M’s or some roasted peanuts to the mix. The recipe couldn’t be any simpler or easier to prepare. To start toss together oats and sugar. I also like to add a couple of tablespoons of brown sugar to this granola, I find it adds a gorgeous caramel flavour and gives the granola a slightly crunchy texture. Then all you need to do is melt together peanut butter, oil, honey/maple syrup and vanilla. Once melted, pour it over the oats and stir to coat. Spread out on a large baking tray and then bake until golden. I told you it was easy! Once the granola is cooled I really like adding about a whole packet (100g / 1/2 cup of milk chocolate chips – I sometimes add dark chocolate chips or cut up chunks of chocolate if that’s what I have in my store cupboard. 1. Preheat oven to 150°C / 130°C Fan / 300°F / Gas Mark 2. Line a large baking sheet with baking parchment or a silicone baking mat. 2. In a large mixing bowl toss together the oats and brown sugar (if using). 3. In a small saucepan, on a medium heat melt together the oil, peanut butter and maple syrup/honey and vanilla. Don’t boil this mixture too hot. 4. Pour the melted peanut butter mixture over the oats and mix to combine. Make sure all the oats are completely moistened. Spread the mixture out over the baking sheet and bake for 35 minutes – stirring every 10 minutes or so. 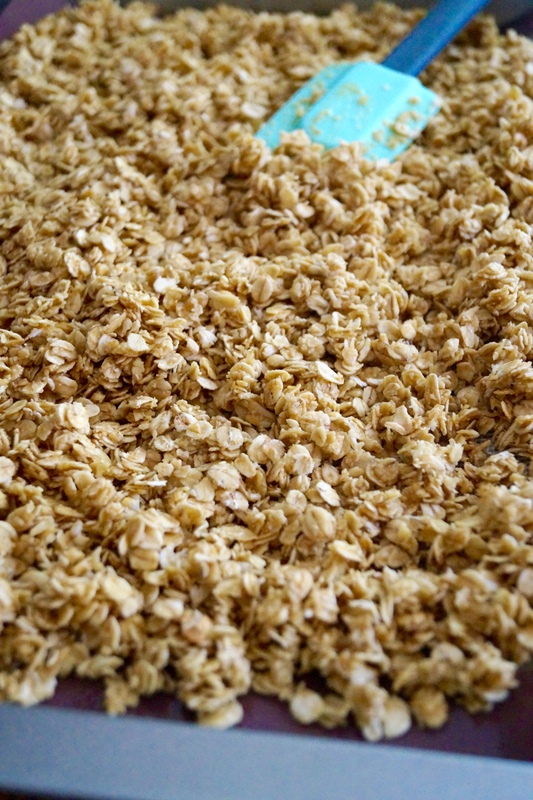 Once the granola is cooked, it will be soft and lightly golden. 5. Leave the granola on the tray to cool. As it cools it will get crisp. Once completely cool, mix through the chocolate chips. Store in an airtight container or jar. Enjoy with milk or Greek yoghurt. Easy, healthy and nut-free granola. This recipe will soon be a staple for your weekday breakfast and it can be topped anyway you like! Looking for an affordable, healthy and delicious breakfast recipe? If so, I have a great granola to share with you. Breakfast is the most important meal of the day as it’s what sets you up for the day ahead. Granola just like cake and cookies is another one of my favourite things to make. Most granola recipes I make usually tend to be for a crunchier, clustered-style granola, which is typically higher in fat and sugar. But since I like to keep as healthy as I can I wanted to share a healthier and lighter granola that can be eaten for breakfast or that could also even be enjoyed as a nourishing snack. To make my granola, oats are combined with honey (this can be substituted with agave nectar or maple syrup for a vegan granola), oil and cinnamon and vanilla, the last two of which are both optional additions. I’ve experimented adding ground cinnamon to my granola whilst testing out this recipe, the cinnamon adds a warming flavour and it also brings some health benefits. Cinnamon contains anti-inflammatory properties and it also helps stabilise blood sugar levels. A bit of food science for you! Granola is one of my go-to breakfasts to enjoy weekdays before heading to work and my favourite way to eat this granola is with Greek yoghurt and fresh berries. If you wanted to try something different you can even layer the granola with yoghurt and fruit compotè in a jar and make yourself a granola parfait. With this basic recipe you can add anything extra you’d like such as different nuts or even dried fruit like apricots, cranberries or raisins and if you’re a chocoholic just like me you can add chocolate chips! Weigh the oats out into a large mixing bowl and toss together with the cinnamon (if using). In a small saucepan gently heat together the honey, oil and vanilla until warmed. Don’t boil this mixture. Once the granola is baked, take it from the oven and leave it to cool. As it cools it will get crisp. This granola will store in an airtight container for up to 2 weeks – it may last longer, but this never lasts longer than a week in our house and I personally think it tastes a whole lot better when it’s fresh.